The formation of disulphide bonds is probably the most influential modification of proteins. These bonds are unique among post-translational modifications of proteins as they can covalently link cysteine residues far apart in the primary sequence of a protein. This has the potential to convey stability to otherwise marginally stable structures of proteins. However, the reactivity of cysteines comes at a price: the potential to form incorrect disulphide bonds, interfere with folding, or even cause aggregation. An elaborate set of cellular machinery exists to catalyze and guide this process: facilitating bond formation, inhibiting unwanted pairings and scrutinizing the outcomes. Only in recent years has it become clear how intimately connected this cellular machinery is with protein folding helpers, organellar redox balance and cellular homeostasis as a whole. This book comprehensively covers the basic principles of disulphide bond formation in proteins and describes the enzymes involved in the correct oxidative folding of cysteine-containing proteins. The biotechnological and pharmaceutical relevance of proteins, their variants and synthetic replicates is continuously increasing. 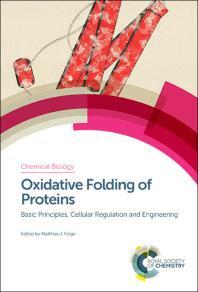 Consequently this book is an invaluable resource for protein chemists involved in realted research and production. GMT+8, 2019-4-19 14:49 , Processed in 0.177649 second(s), 28 queries .